The city that they discovered, called the Megalopolis of the Mayan Snake Kings, stretches over an area twice the size of medieval England. 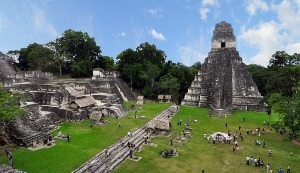 It includes over 60,000 stone structures, hidden by the thick Guatemalan jungle, which were previously overlooked. The city was once filled with interconnected palaces, houses, highways, and temples. This discovery means that archeologists will have to change their viewpoint on ancient Mayan civilization. With such a huge city having existed, the Mayan population must have been much larger than formerly thought: around 10 or 15 million, instead of the five million previously estimated. This information would still be lost if it were not for a new, revolutionary archeological tool called LiDAR. LiDAR stands for Light Detection And Ranging. This technology fires millions of laser pulses from planes to map out precise three-dimensional models of an area. The lasers can penetrate trees and other vegetation, which makes it difficult to find ruins otherwise. Using LiDAR, the team of archeologists discovered the many structures of the city, which they had walked over hundreds of times, after only a few plane flights. Now, with the maps that LiDAR provided, archeologists can explore and study the area in far more detail. Imagine what LiDAR could mean for archeological sites around the world. The new technology could give archeologists more information about many different ancient cultures. The huge Mayan Megalopolis, which provided novel information about the Mayan civilization, is just one example of what LiDAR can do. As time goes on, who knows how many more cities and ruins could be discovered.